One of the more difficult things for me is to find a good source of protein + good fat for on the trail. And by good fat I mean mono- and poly- unsaturated fats with a good dose of omega-3 fatty acids. I tried some sardines but haven't found any I like for the trail. 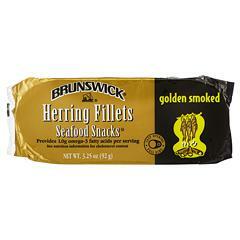 Recently I found a pack of these kippered herring which I enjoyed immensely. I am planning to get some and use for on the trail. They can be eaten in a wrap of sorts with whatever. They can also be put in a soup or with mashed potatoes. They are smoked and only have salt added. If it matters, they are also Kosher. The remaining can is very light, though I neglected to weigh it afterwards. Anyway, just thought I would throw this out there for those trying to add health stuff to your trail food bag. PS: In case you are wondering, kippered basically means a cleaned and butterflied fish, with the bones removed. So no heads or bones to deal with. finding a good brand can be a challenge. taste ranges from "ugh!" to "wow! these are really good!" and everything in between. try Trader Joes. try obscure delicatessens. These are the ones I prefer, I always have a can in the cupboard. I would recommend you carry a sealable plastic bag for the empty can, it stinks to high heaven and if you don't bag it all the local bears will follow you home. That's my only issue with cans of fish on longer trips. Even when sealed in plastic the smell of fish residue in the can be pungent after a couple of days on the trail. I will mostly save it for the last day of a trip when I know I'll be headed home or consume on day hikes. It really is an excellent source of protein. Those "Golden Smoked" kippers are great! Some brands have a weird chemical taste rather than a nice smoked flavor. Like some railroad ties went into the smoker...? I also like high quality sardines packed in olive oil, but they are usually a little costly. Oh, and Vienna Sausages too, even if they are bad for you. On thru hikes we usually put a can of sardines at a resupply where there is a place to drop garbage. After a week or two on the trail they are ambrosia especially in oil. May be nordic heritage. I've really started to like canned sardines. Must be that Scandinavian blood....Alex French Guy Cooking has a bunch of sardine recipes. More for home than backpacking. I like them plain on buttered sourdough bread....yum! Kippers are good too. But yea, with the smelly can, they're best later in a trip. The grocery outlet (bargain market) in Bellevue sometimes has an assortment of canned seafood. I've occasionally found both the above mentioned Brunswick and Polar kippers, along with others.... Yum!! !